The Connection was already released, but due to some unfortunate circumstances (amongst others the crash of our hard drives) it is reviewed a few months late. Our apologies to band and label for this delay, but for the most part this was out of our hands. 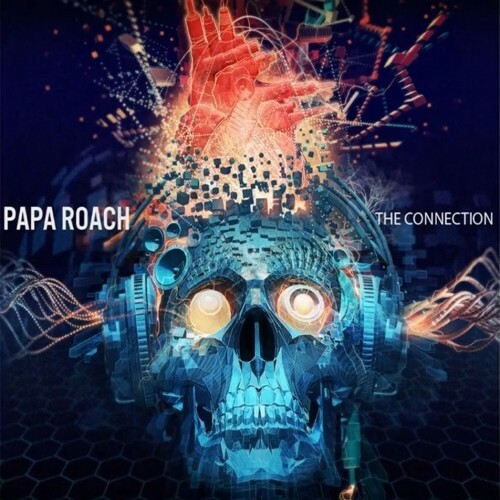 The Connection is officially their 8th full length studio album release (including Old Friends From Young Years and Time For Annihilation) of the excellent live band that Papa Roach is. I have a sweet spot for Papa Roach. Like every metalhead between 16 and 20 years old Last Resort was one of those anthems that was part of my life growing up. Despite the fact that Infest is widely seen as their best album by the fans, I have always been a bigger fan of their more rockier release Getting Away With Murder. Up until now they haven’t surpassed this release and everything was clicking on that album. From the anthemic feel to the great hooks and a Jacoby Shaddix in excellent form. Metamorphosis was a bit of a let-down for me. It was too poppy and too safe. There are some great tunes on this album, but it still has quite some fillers on it or at least songs that aren’t up to par with the level that I compare Papa Roach to. Of course bands grow, but this wasn’t really growth for me, but more a sound that was getting stale. The Connection is an improvement over Metamorphosis, but still stand in the shadow of predecessors like Getting Away With Murder, Infest and Lovehatetragedy. Despite that it doesn’t live up to those album, it’s still one that I enjoyed listening to. The biggest difference with Metamorphosis is that it’s a bit more ballsy, more uptempo and of course the use of electronics on the album. Luckily the electronic elements are mixed well into the rest of the music, it hasn’t been put on top of the songs (which is done frequently by other bands), but they found a way to nicely incorporated it in their sound. A slower song as ‘Before I Die’ really benefits from the use of electronics. It just gives it a bit extra, otherwise it had been a forgettable song, since it has nothing really noteworthy to write about. The album opens furiously with ‘Still Swingin’. A nice uptempo song with lyrics that find their way to the brain with ease. The momentum keeps up with ‘Silence Is The Enemy’ (simple but gets the job done) and my favourite track ‘Wish You Never Met Me’. The latter has a slower pace, but with some interesting guitar loops and also the vocal performance of Jacoby Shaddix is excellent. I also like the rap parts in ‘Not That Beautiful’ which gives the listener a trip down memory lane. Excellent combination of old and new Papa Roach. This sounds all good and all, so you would think that The Connection is up to par with the early mentioned releases. Unfortunately it’s not. There are some filler songs on it, which are really boring. Especially the last three songs don’t add anything to the album. I have heard everything done earlier on the album and this in combination with a complete lack of interesting riffs make those songs redundant. It’s too bad that the album ends this way, because it leaves me with a bitter taste in my mouth and that’s a shame for an allround enjoyable effort. The album is a huge step above Metamorphosis and shows a Papa Roach back to form. Due to some weaker songs it doesn’t have the same impact on me like Getting Away With Murder for example had, but it’s definitely an album that will finds its way to my stereo frequently. 4. "Silence Is the Enemy"
6. "Wish You Never Met Me"
7. "Give Me Back My Life"
9. "Leader of the Broken Hearts"
13. "As Far as I Remember"